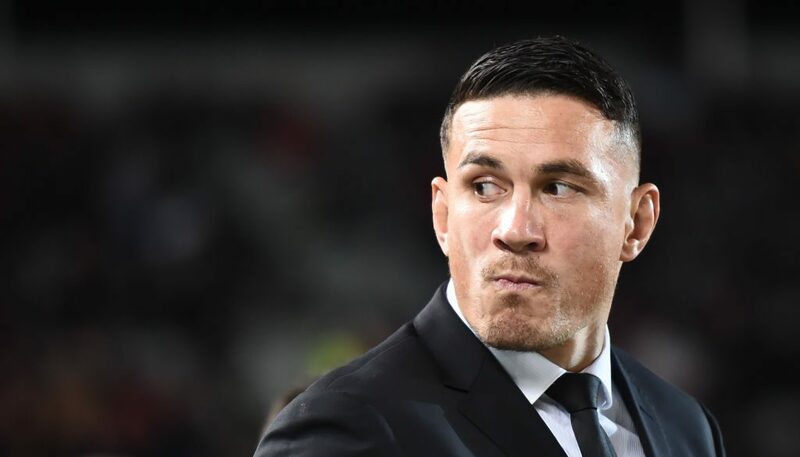 Two-time World Cup-winning All Black centre Sonny Bill Williams will miss his side’s opening Rugby Championship clash with Australia in Sydney on August 19, according to the New Zealand Herald. This is after a World Rugby hearing decided that the 28-year-old’s four-week ban for a reckless shoulder charge to Anthony Watson’s face during his side’s second Test against the British and Irish Lions would be extended up to and include August 19. Due to World Rugby’s regulations, the ban the former league star received was actually four matches. Williams, the first All Black to be sent off since 1967, missed the crucial third Test with the Lions as well as his Super Rugby team the Blues’ shock 48-21 defeat to the Sunwolves in Tokyo. This led to the All Blacks management seeking clarity from World Rugby about what clarified a ‘match’ in the hope that pre-season games for his club, Counties-Manakau, and perhaps even a club fixture for the tiny Puni Rugby Club in South Auckland would count as a part of his suspension. All matches – be they club or Test games – are considered equal under World Rugby’s regulations, with pre-season games also counted as competitive matches, so it appeared that the 36-times capped star would have a chance of making the Bledisloe Cup clash. As a result, Steve Hansen was optimistic that Williams would be able to start in Sydney next month. The fact that one of his key men will now be unavailable for the clash is a blow for the All Blacks head coach, as he seeks to win a fifth Rugby Championship since he took over the reins from Graham Henry in 2012. Southern hemisphere rugby’s showpiece event will also give the reigning world champions a chance to start putting the frustrations of a drawn series against the British and Irish Lions behind them. With Williams, one of the best inside-centres in the game unavailable, Hansen will once again have to tinker with his midfield. Since the first Test against the Lions at the end of June, he has had to change his centre pairings three times. With the gifted Ryan Crotty back in action after recovering from a hamstring injury sustained in the first Test, Hansen will probably go with the Crusader at 12 and Anton Lienert-Brown at 13. Presenting their case at the hearing, New Zealand explained that Auckland-born Williams would play for his province Counties Manukau, who play in the Mitre 10 Cup, in a pre-season game against North Harbour as well as in an inter-squad match involving Counties B. In response, the judicial committee were satisfied that the former game against North Auckland was meaningful. But they were not convinced that the latter game to be held on August 5 could be considered to “be a meaningful match”. Adding that the match “would not have a meaningful playing consequence” for the 6ft 4in, 17st powerhouse and coming to the conclusion that it was ultimately “an internal club trial”. Williams’ hopes of making the match were dashed when the committee decided that New Zealand’s traditional and extremely popular “Game of three halves” against Counties and Taranaki could not be considered either. According to the committee, the game, which is played at different venues across the country every year because of the fact that a completely new team is introduced after half-time, does not fit with World Rugby’s definition of what a match is. Whilst Williams has 48 hours to appeal against the decision, it is unlikely that the former Toulon back will do so. With he and the All Blacks management having apparently exhausted every possible route to make him available for the match, it would appear futile to try and appeal the decision. Williams will now have to be content with a return to action the following week, as New Zealand host the Wallabies in Dunedin on August 26. Hefin is a sports anorak with a love for cricket, boxing and football but a particular penchant for rugby. English teacher, Journalism student and Scarlets fan. Attempt to tweet trilingually @hefrhys.